10 Best Cross-Country Skiing Trails in Michigan! So, you want to go skiing in Michigan. Considering that we have a whole lot of winter, it’s the ideal activity. Cross-country skiing trails in Michigan are abundant, offering terrain for a variety of skill levels. It’s an excellent workout for everyone to enjoy. Here are the 10 best cross-country skiing trails in Michigan. 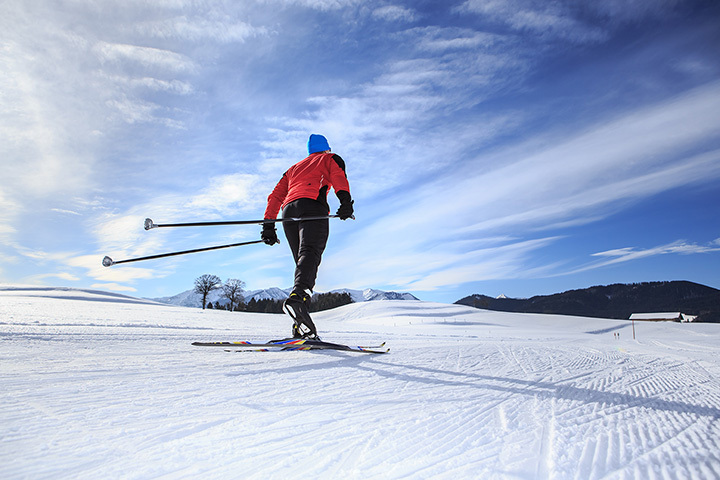 Head out to Frederic for a shot at Forbush Corner, a cross-country skiing experience geared toward the Nordic run. Forbush Corner offers several miles of trails, as well as some snowshoe trails for those who want something a bit different. Rental equipment, lessons, and even some food service allow for a complete day of cross-country skiing fun amid wooded trails and natural splendor. Easily one of the biggest cross-country skiing opportunities Michigan can offer, some reports suggest that Ironwood's ABR Trails boasts somewhere around 45 miles of trails. This encompasses several different skill levels from the barest beginner to circuits taking three hours or more to complete. One trail recommends you bring food and drink along, showing you just how potent ABR Trails can be. Widely known for its skiing activities, Boyne Mountain in Boyne Falls features roughly 22 miles of cross-country skiing trails available. From the simple trails rolling through pine forests—often complete with that pine forest smell—to some much more complex and difficult runs that boast terrain to make any experienced skier struggle, Boyne Mountain will have something for every taste and ability level. Michigan's lakes are perhaps its best-known feature, but with lakes—especially those of that size—comes the clear possibility of islands, and Michigan has several. For an amazingly natural cross-country skiing experience, try out the cross-country action on Drummond Island. With 15 miles of trails on hand, groomed to perfection, and skis available for rent—those who are guests of the Drummond Island Resort can get these for free—there's plenty of wilderness waiting to be seen. One of Michigan's great natural wonders and an amazing place for hiking and other outdoor activities, these same qualities make it wonderfully well-suited for cross-country skiing too. Come check out the place “Good Morning America” once called the most beautiful in the United States and slide across it with your cross-country skis! Whether you're looking for some exercise or a place where getting around on cross-country skis is an option, you're going to want to take your skis to Mackinac Island. An island full of history, where cars are largely forbidden, your main source of transportation might well be your cross-country skis. Even if you'd rather just hit a trail, don't worry. There are plenty of trails around ready to be enjoyed on Mackinac Island. Admittedly, Michigan is not famous for its mountains. We do have some, sure, but this is no Colorado to dazzle with mountains. The few that are here, like Crystal Mountain in Thompsonville, take advantage of their comparative rarity to offer some of the best skiing around. Home to the only Fisher Key Nordic Center in Northern Michigan, and boasting a complete training center, Crystal Mountain is a great place to get started in cross-country, or perhaps just carry on. Interested in nearly 20 solid miles of cross-country ski trails? Then head to Bellaire and Shanty Creek. Home to a hefty slug of Nordic cross-country ski trails, Shanty Creek also offers lessons and equipment rentals for those looking for a more casual experience. Throw in a variety of other activities—a tubing park is poised to open Christmas Day at two in the afternoon—and Shanty Creek will offer a little something for everyone. In case you thought that cross-country skiing was mostly a Northern Michigan thing, think such no longer. Grand Haven is home to Pigeon Creek Park Trails, a routinely-groomed 10-mile stretch that offers an array of skill options but with virtually no change in elevation. Throw in the fact that it's near one of Michigan's biggest tourist towns and you'll find more than enough to keep you busy and entertained long after you've shaken off the chill of being outdoors all day. Known as one of Michigan's great natural wonders and one of the biggest sets of mountains in the state, the Porcupine Mountains near Ontonagon, the Porkies, as they're sometimes called are home to a whopping 26 miles of cross-country ski trails. For a truly unique experience, going on certain Saturdays nets you access to the Lantern Light run, a one-mile loop lit solely by kerosene lanterns. Halfway around, a bonfire is ready to warm up those who need a bit of a break. This isn't the end of the list, of course, and opportunities to cross-country ski in Michigan will be as plentiful as snowflakes on the ground in January usually are. Plenty of skiing awaits, cross-country or otherwise, so pack up your skis and get on out here! View more Michigan Cross Country Skiing Trails.